A few years ago when I went to New Orleans for a week, the yoga studio sprinkler system went haywire and we had a flood. A big one. It took us two weeks of being closed with industrial sized fans to dry out the place. 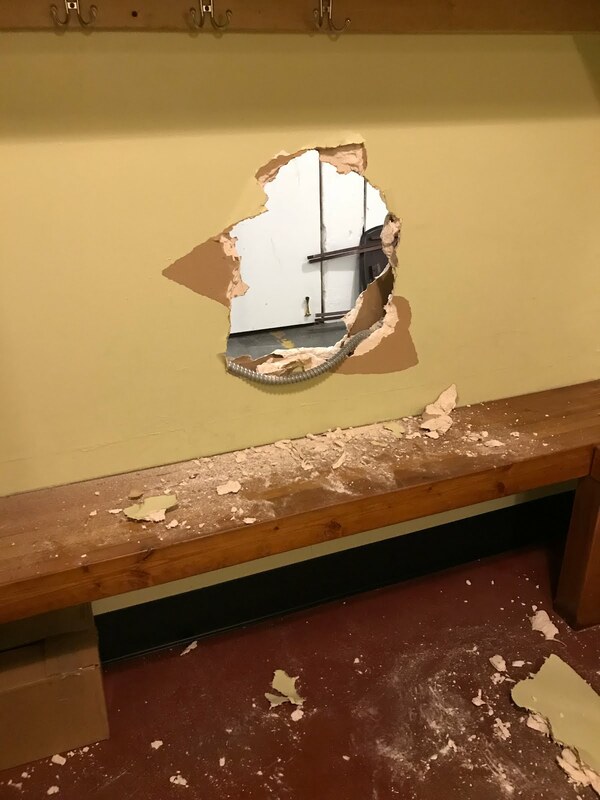 Yesterday morning, while I was in Chicago celebrating Passover with my four siblings and our families, I received a phone call in the middle of the night from the Seattle Police Department that someone had broken into The SweatBox. I didn't get the message until I woke up in the morning, four hours after the incident. The message said that someone had broken in and done damage. They needed someone to identify what items had been stolen. I was in Chicago, twelve hours away from my 8pm flight time that night. Eventually I got a hold of Nancy who met Seth and the police at the studio. Between the two of them they managed to get the full scoop from the police, clean up the place and get students ready for Seth's 8am class. They assessed that the burglar, who the police actually caught, had taken nothing. He had, however caused significant damage. In addition to the front lobby window he broke through, he smashed one of our bathroom toilets and, in an attempt to escape police, actually kicked through a wall in the men's dressing room into the main area of our building. Once I got the story from Nancy and talked to the officer on duty, I was able to take a breath. A patron at Neumos, the night club down the street had seen the guy break the window at 2:30am and called the cops which ultimately resulted in his arrest. No one was hurt. Students checked in while the police took the report and classes would continue as normal all day long, despite the broken toilet and demolished wall. I hung up the phone, took a deep breath and went on to enjoy my last hours with my siblings and their kids before flying back to Seattle. When I arrived to the studio today, tired from a midnight arrival last night and very little sleep for the worry I was holding over the repairs to be done to the studio, I was pleasantly surprised. It was the same. Yes, the front window was boarded up, but as I walked in at 7:30am, greeting the 6am students who were leaving and the 8am students who were just arriving, it was as if none of it had happened. The energy was the same as it always is. People were laughing and chatting and sweating. I shared the bits and pieces of the burglar's escapades with people and we all laughed imagining someone escaping by kicking through an actual wall!!! 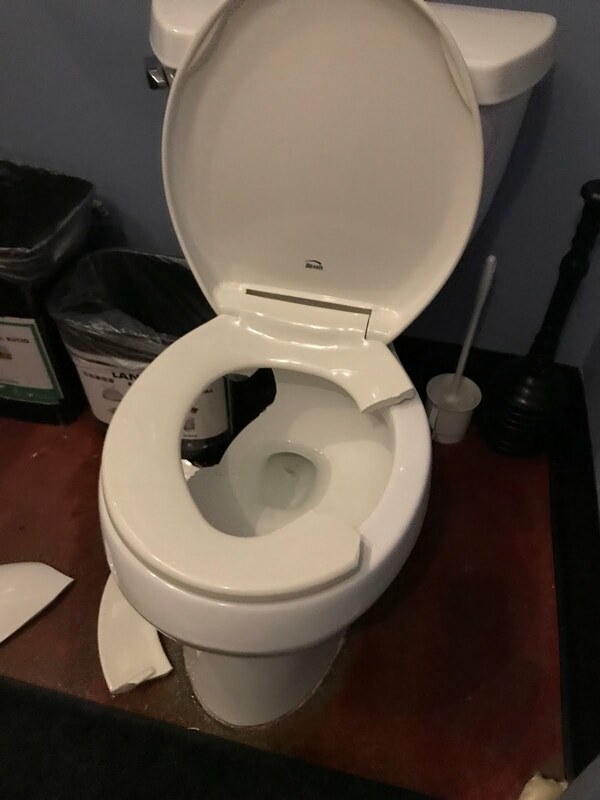 By the time I left today the toilet had been replaced, the men's dressing room wall had a preliminary sheetrock patch, and all of the glass shards were safely in the belly of the shop vac. The insurance claim was filed and it felt like business as usual. Just like that. I felt actual happiness, joy even for the fact that it all worked out. I'm not surprised that our studio was broken into. Times are desperate. So many people are struggling-- with poverty, addiction, anger and despair. Maybe the guy who did this was just pissed at the world and needed a place to rage. Maybe he really thought he'd get some cash from a little yoga studio. I'm not glad this happened. It will cost me money and it caused a great deal of stress for me and many other people, but it also renewed our sense of community, of gratitude for the connections we have in our little village of Capitol Hill in our growing city of Seattle. The SweatBox is open and ready to serve. All are welcome.